On February 7, an overflow crowd of steel workers and concerned citizens attended and gave testimony to a joint Senate and House Democratic Policy Committees’ hearing on ways to improve air quality, community notification procedures and emergency response in Allegheny County.. The hearing was held at the Clairton City Hall at the request of Sen. Jim Brewster (D-Allegheny) and Rep. Austin Davis (D-Allegheny). 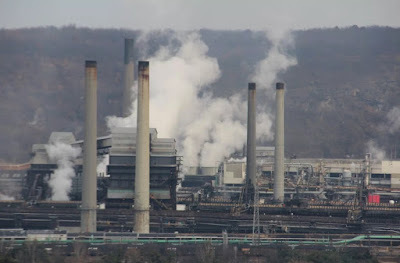 It was prompted by a December 24, 2018, fire at the Clairton Coke Works that resulted in emissions of high levels of sulfur dioxide and damage to the facility’s gas processing system. The hearing was jointly chaired by Sen. Lisa Boscola (D-Lehigh) and Rep. Mike Sturla (D-Lancaster)..
“Being raised in the shadow of the Bethlehem Steel plant, I am well aware of the seriousness of air quality issues and how communities such as Clairton must balance an economic reliance on good industrial jobs against health and environmental issues,” Sen. Boscola said. U.S Steel, which operates the Clairton plant, said it is committed to keeping the coke works operational and doing more to improve its environmental efforts. Allegheny County is responsible for controlling air pollution in the county, not the Department of Environmental Protection. The hearing follows a January 22 public meeting in Clairton. Sen. Brewster, Rep. Davis and Senate Democratic Leader Jay Costa (D-Allegheny) and Rep. Bill Kortz (D-Allegheny) and Austin Davis (D-Allegheny) were also updated on January 25 by officials from the Allegheny County Health Department. Joining Senators Brewster, Boscola and Costa at Thursday’s hearing were Senators Wayne Fontana (D-Allegheny) and Lindsey Williams (D-Allegheny). In addition to Representatives Davis, Sturla and Kortz, Representatives Summer Lee, Ed Gainey, Dan Miller, Brandon Markosek and Sara Innamorato (all D-Allegheny) attended. Click Here for a copies of written testimony. For more information, visit the Senate and House Democratic Policy Committees webpages.